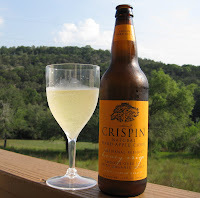 I was finally able to get to the two ciders in the Artisanal Series from Crispin Cider - the Honey Crisp and The Saint. The Artisanal Reserves use racked unfiltered apple wine, fermented from fresh pressed apple juice, never from concentrate, and smoothed with novel organic natural sugars, such as honey or maple syrup. The unfiltered nature of the apple wine leaves a rich apple sediment in the bottom of every bottle, a true treat in a hurried world, every bottle should have a "Bottoms-Up!" tilt and swirl before opening to ensure even dispersion of the sediment and a fair sharing of the complex flavors. Relaxing on a patio overlooking rolling green hills during a weekend getaway to the Texas Hill Country seemed liked the perfect atmosphere to finally try the Honey Crisp cider. It's pretty light in colour but a little cloudy since I swirled the liquid when I poured it into the glass as suggested. Aromas and flavours of fermented apples with a floral sweetness from the added honey. Additional flavours of pear and a bit of breadiness came out as it warmed. The carbonation is low, but it still left a slight tingling across my tongue. Finish was smooth and creamy with a drawn out lingering sweetness. Easy to drink on its own, even at 6.5% ABV, but it would probably pair well with a light meal. The Saint was the one I was looking forward to trying the most as it's fermented using a Belgian Trappist yeast. Trappist yeasts tend to give fruity flavours with a dry finish, so it certainly seems perfect to use for their style of cider. It was cloudy in the glass due to swirling up the yeast and slightly darker then the Honey Crisp. Aroma was floral and slightly spicy. Big juicy apple flavour to start with a sticky sweetness coming from added maple syrup. However, that sweetness soon gave way to a tart and slightly spicy finish with a lingering dry mouthfeel. Very lightly carbonated, but enough so that its not completely still in the glass. Once again, a 6.9% ABV is very well hidden. I wouldn't choose this one to quench my thirst on a hot afternoon (go with the Crispin Original for that), but keep this one to savour later on in the day either before or with dinner. I certainly enjoyed both of these ciders and thank Crispin Cider for giving me the opportunity to try them. Unfortunately, they're just a tease as they're not yet available in my area, but hopefully that will change soon. There are still have two more ciders that I received from Crispin to review, but these are from Fox Barrel, a California cider company that Crispin just purchased back in January of this year. Reviews of the Pear and Black Currant will finish off the three part series. These reviews are a really good read. And you are right... a bit of a tease. Very well done overall and tempting enough to give these a shot whenever they hit our market.